Cut bananas into 2 1/2” tall segments (roughly 3 per banana), trim the narrow ends, and leave the skin on. Quickly hollow out a 1/2” circle in the center of the banana. 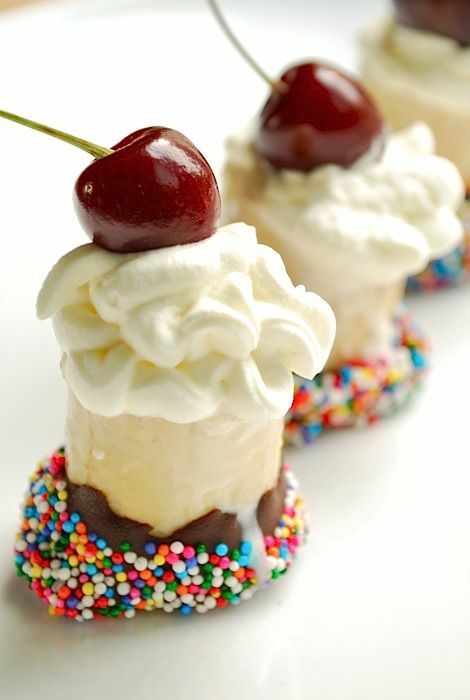 Add a tiny scoop of ice cream into each hole and put the bananas in the freezer to set for 30 minutes. Note that it’s best to leave the skins on until just before dipping in chocolate. I removed them before adding the ice cream and the bananas browned slightly. Either in your microwave, or in a double boiler, heat the chocolate until it is melted and smooth. Whip the cream to soft peaks, add the sugar, and then whip to stiff peaks. Set out your sprinkles. Remove the banana peel, dip the bottom of the banana in the melted chocolate and quickly coat with sprinkles. Set bananas back in the freezer for 5 minutes until the chocolate sets.